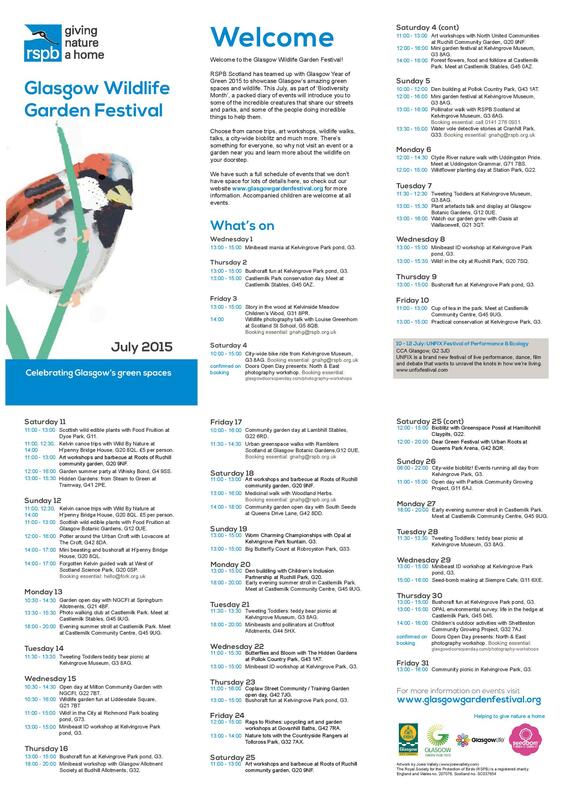 Check out the new leaflet for the Glasgow Wildlife Garden Festival 2015! The festival is a collaborative effort between RSPB Scotland, Glasgow City Council and dozens of other charities and conservation groups, community gardens, allotments, parks and organisations. We're all working together to bring you around 70 events taking place across the city, with something happening on every single day in July. There are events suitable for tiny tots and families, hands-on activities like practical conservation and den-building, and loads of fascinating talks, guided walks, open days and workshops. The artwork was created by Glasgow artist Josie Vallely (www.josievallely.com) and we'll have a separate blog from Josie soon explaining how it was all put together. If you have any questions about the festival, you can tweet us on @RSPBGlasgow (#GlasgowWildFest) or email gnahg@rspb.org.uk. More details can also be found on our events pages, and you can download the full leaflet below.